INDIANAPOLIS, Ind. 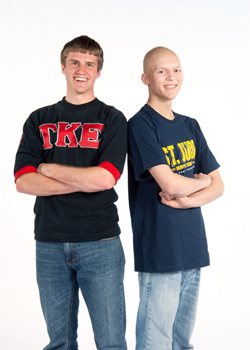 - Through the work of the Collegiate Advisory Committee, Tau Kappa Epsilon renewed its partnership with St. Jude Children’s Research Hospital in 2008. During the last year, nine chapters raised more than $19,000 for the hospital. If nine of our 274 active chapters can raise $19,000, imagine how much the TKE Nation could raise if all chapters donated a portion of their philanthropic funds to St. Jude Children’s Research Hospital! How much will YOU raise in the fight against childhood cancer? In 1962 Frater Danny Thomas founded St. Jude Children’s Research Hospital with the vision that, “No child should die in the dawn of life.” Since the founding, ALSAC was created to better encourage/support the fundraising efforts of organizations for St. Jude. There are currently 15 different ALSAC/St. Jude offices across the country equipped with a knowledgeable staff ready to assist TKE Chapters in their philanthropic efforts. Chances are there is an office near you with a regional representative ready and willing to help! When the hospital opened doors in 1962 the survival rate for the most common form of childhood cancer (Acute Lymphoblastic Leukemia – ALL) was 4% and today it is at an astonishing 94%! Are you wondering how YOUR chapter can help that 94% survival rate reach 100%? Here is what some other chapters are doing to raise funds for the children of St. Jude - take a look. Through on-line fundraising efforts as well as letter writing campaigns, Tau Kappa Epsilon is striving to raise awareness and funding for St. Jude. Check out the TKE/ St. Jude site to see what your chapters fundraising webpage can look like and how easy it is to get started. The commitment to St. Jude is made, and the TKE Nation is more than ready for the challenge! To get started, contact Brett Collins of St. Jude Children's Research Hospital or TKE Director of Communication Tom McAninch at 317.872.6533.